For Question Evolution Day, I reckoned I'd point out a major bit of weirdness that anti-creation tinhorns saddle up and ride. I've seen many logical fallacies that they use, and try to not only watch my own reasoning, but encourage Christians and creationists to learn about fallacies as well. This is to keep us from getting intimidated by bullies, but also to be more accurate in our own presentations and discussion. Many fallacies can be grouped together in the "red herring" category. That is, they're distractions. The ad hominem is the staple of atheists, saying things like, "You're stupid for believing in God and creation". Maybe I'm stupid, and my mother dressed me funny, too, but what does that have to do with the article's content? Another is the "straw man", where people put words in your mouth or otherwise misrepresent your position. "Hasty generalizations" are popular among atheists, where they find an article about how some pinhead refused medication because he expected God to perform a miraculous healing and he died, so the atheist uses that to say how all "religion" is bad. Yes, I've seen it. The problem with distractions is that the thing might start regarding something a creationist posted on social media about, say, how the appendix is not a "vestigial structure", and the discussion is now about the "Ark Encounter" court battle of Answers In Genesis. The original discussion lit a shuck out of Dodge because of the distractions. Part of this is when a Christian or creationist posts a link to an article and the Evo Sith demand answers from the one who posted it. In fact, they tend to expect whoever posted the thing to be an expert on all things they post (as if those making the demands were experts in those fields themselves). I didn't write the thing, sorry. Why don't you follow the link to the main article and contact the author or organization responsible? Of course, they seldom read what is posted in the first place. By the way, many of the linked articles are written for us reg'lar folk. Critics occasionally complain about what is not included in them, as if that invalidates the whole thing. If people want the sources, they can click on the links included in such articles. 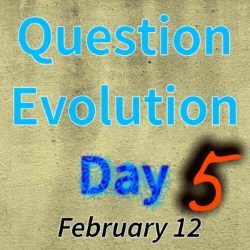 For that matter, if they want the deep science (and if village evolutionists can understand them), they can subscribe to the peer-reviewed creation science journals. Don't get me wrong, I have to answer for what I do write. Problem is, when I write posts that have the Introduction-Excerpt-Link format, statements in my introduction are usually addressed in the linked article. So, if someone is going to criticize, be sure to check out the linked article and supporting links. Much obliged. 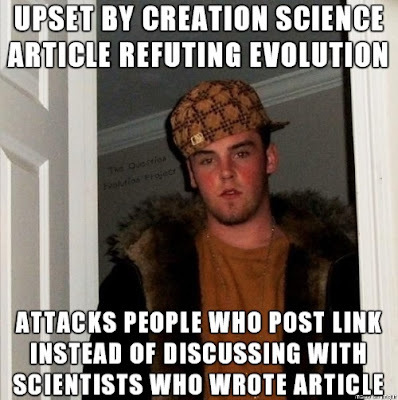 We need to keep anti-creationists on-topic. They hate that. It also may lead to a good discussion in some cases, though. When they get to the personal attacks, blasphemies, and other things, feel free to disengage. It's not up to us to convince them of God's love and the truth of creation, we just need to present our case best that we can.